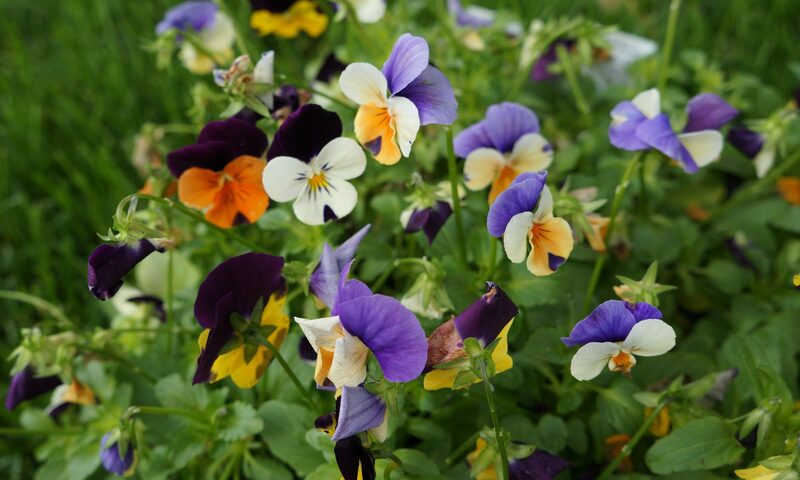 Looking for gardening inspiration? 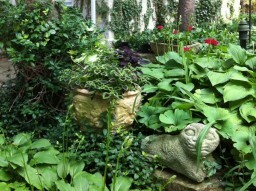 Here are some photos from our members’ gardens featuring plants from our Annual Spring Plant Sale. 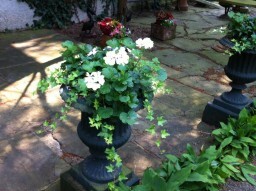 White Ivy Geranium with Purple New Guinea Impatiens and Ornamental Ivy grown in part sun/part shade. 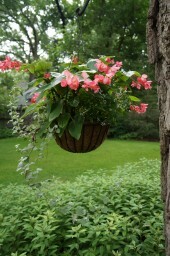 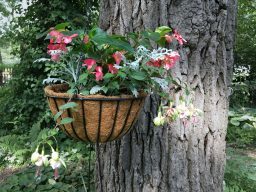 Hanging Basket – Dappled Shade: Pink Dragon Wings Begonia, with Euphorbia and Silver Licorice. 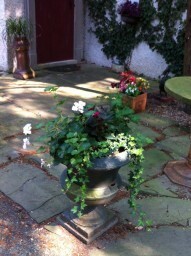 Green Leaf Begonias grown in part sun/ part shade. 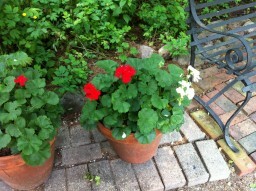 Red and white Geraniums grown in part sun/part shade. 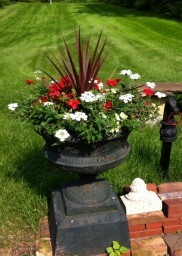 Red Spike with red and white Verbena grown in mostly sun, and a little shade. 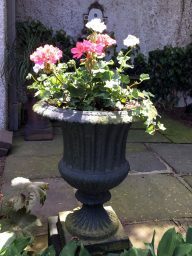 Part sun, part shade, pink dragon wing begonia, blue lobelia, dusty miller, asparagus fern and green spike. 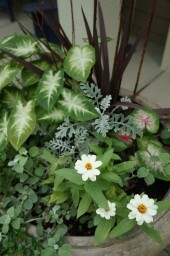 Container – Mostly Shade: White and Pink Caladium, with Red Spike, Dusty Miller, Silver Licorice, and White Short Zinnia. 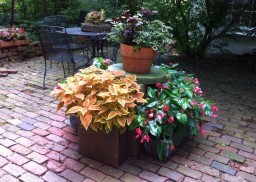 On the table is Coleus Tell Tale Heart with Iresine Purple Landy. 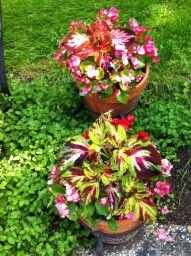 On the ground is Coleus Sunset Orange and pink Dragon Leaf Begonia. 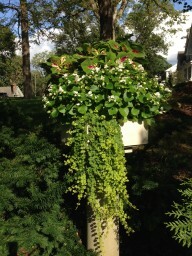 All grown in part sun/part shade. 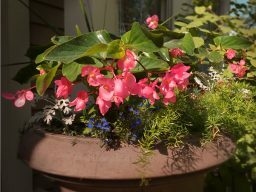 Perilla Magilla, red dragon wing begonia, black and blue salvia, creeping jenny, yellow torenia, sweet potato vine-blackie, one of each, grown in part shade. 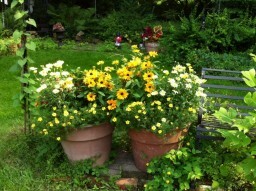 Rudbeckia Tiger Eye with yellow and white Marguerite Daisies, grown in mostly sun, with a little shade. 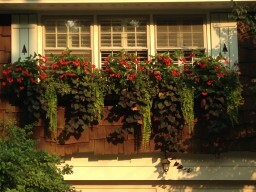 Window box in part shade: red-dragon wing begonia, yellow torenia, purple angelonia, creeping jenny, sweet potato vine-blackie, 5 of each. 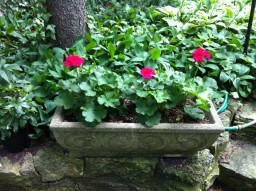 Pink and white geraniums with English ivy. 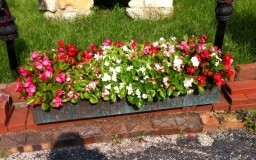 Part shade, pink dragon wing begonia, pink fuschia, and dusty miller. 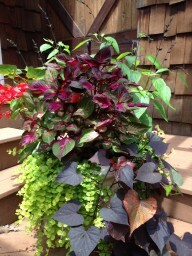 Roaring Fire Coleus and Green Leaf Begonia, grown in part sun/part shade.